If you’re on the MIT network, Factiva (http://libraries.mit.edu/get/factiva) is now the easiest way to read The New York Times Op-Ed columnists online. Those of you who read Times Op-Ed columnists online on http://nytimes.com may have been disappointed on Sept. 19 when free online access to those columnists was removed. The regular columnists are now part of an $8-a-month premium service called TimesSelect. 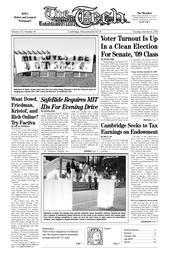 The MIT Libraries subscribe to several services that contain full text of The New York Times, though most are not designed for casual reading. The best available choice for Times opinion columns is Factiva, a joint service of Dow Jones and Reuters. Factiva’s interface could use some work, but it is improving. Prior to September, it required Internet Explorer and failed dramatically with Mozilla or Firefox. It now supports Firefox but does not work with tabbed browsing, a popular feature. The Libraries also offer The New York Times through Lexis-Nexis Academic Universe (http://libraries.mit.edu/get/lexis-nexis), which is optimized for searches, rather than casual browsing of the day’s news. Still another option is ProQuest’s New York Times Historical Archive (http://libraries.mit.edu/get/proquest), which has full page PDF images, though the most recent is three years old, and the quality of photographs and other halftones is poor. Factiva sometimes breaks when one logs in: “You do not have permission to see this page.” A workaround is to delete the “=Personal” from the end of the URL, and try again. Deleting cookies also works.